Gainesville is the largest city within Alachua County and North Central Florida. It is known as the educational, cultural and commercial center for the north central region of Florida and offers its residents with parks and recreation, cultural and nature services and so much more! The city is located along I-75 halfway between Miami and Atlanta and also possesses a municipal airport and a regional transit system, so getting around from place to place will never be an issue. With mild winters and warm summers, the city has a 255 day growing season, so agriculture is one of the booming industries in Gainesville. Manufacturing, health care, academic research are some of the other main industries thriving within the city. With all of these trades, in addition to many more small businesses in the area, there are plenty of career opportunities for Gainesville residents to take advantage of. Gainesville offers so many entertainment options. From sandy beaches, to golf courses, to music venues and festivals, you will always have something to do! Home of the Florida Gators, Gainesville offers plenty of sporting events to attend. Gainesville offers a very eclectic art culture and holds large art festivals each year. In addition, the city also features plenty of dining and shopping options. Gainesville was named “Healthiest Community in America” back in 2003 after it received the “Gold Well City” award from the Wellness Councils of America. It was the only city to achieve this award until 2011. All residents of Gainesville can achieve a great education within the Alachua County Public School system, which includes 75 different institutions in the entire county. Gainesville is the home of the University of Florida, and receives a great financial boost from its athletic events and the thousands of jobs it creates. Other major colleges located within Gainesville are Santa Fe College and City College. So, if a higher level education is what you seek, rest assured that it is in the reach of your fingertips when you make our Gainesville college apartments your new home. 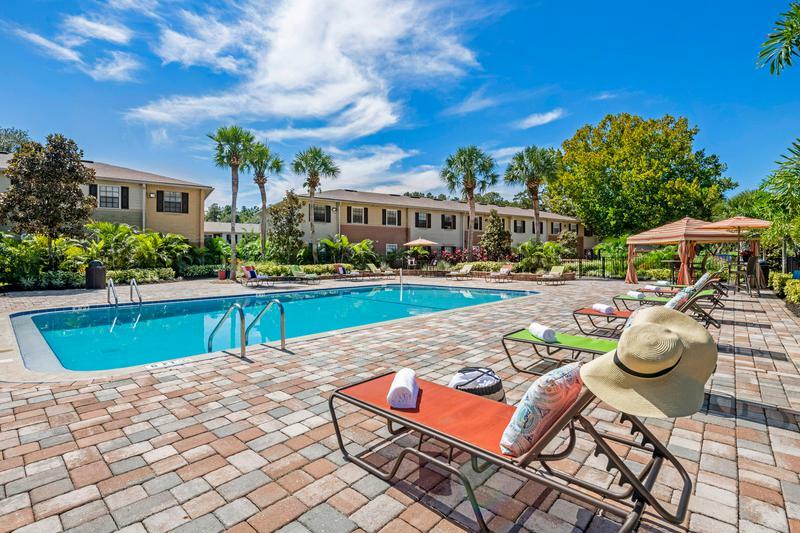 Nestled close to everything in an unbeatable location is one of Aspen Square Management’s Gainesville, FL apartment communities: Ridgemar Commons. Ridgemar Commons is located on the corner of SW 34th and 35th and offers one and two bedroom apartment floor plans. This exceptional location is close to everything including the Hippodrome Theater, Shands Hospital, University of Florida, and I-75 giving you easy access to all Gainesville has to offer. Our Gainesville, FL apartments for rent are also located along the RTS bus route, so public transportation is right at your door! All apartments feature gorgeous kitchens with granite-style countertops and optional white cabinetry. Enjoy the comfort of your new home with central AC and heat as well as a set of full-size washers and dryers. Bathrooms are modern with updated nickel fixtures and optional wood-style flooring is available. If you’re in need of a place to stay but don’t have the belongings to fill it, we also offer furnished apartments. Have you always wanted to bring your pup to an off-leash dog park where they can run around and try out agility obstacles? Then you’ll love our Gainesville apartments. We’re pet-friendly and that includes large breeds! With a resort-style pool, state-of-the-art fitness center, business center, basketball court, and so much more, you will be living in luxury. Ready to make the move to our luxury apartments in Gainesville, FL? Then come home to our exceptional Gainesville, FL apartments for rent, our friendly staff is waiting to speak with you!